TUM Asia accepts a single intake for our Master of Science programmes, with the course commencement in August each year. To apply for the programmes, you are required to start your application on our Online Admissions Portal. Admissions for the Master Programmes (2019 intake) is now open till 30 April 2019. First, submit your application online (with softcopy application documents) through our Online Application Portal here. Complete the submission with the payment of the one-time processing charge (S$79 (inclusive of GST)) on the application portal. Once the online application is submitted, your application and uploaded softcopy documents will be assessed by our Admissions team. The pre-assesment process will take 4 to 6 weeks and you will be informed of the results via email. Please be patient with us as you wait for your results. Not sure what to do to apply for our programmes? Download our helpful guide here! ^Please do not mail any documents to us if we did not tell you to. We do not return any hardcopy documents that are submitted to us. Documents that are not in English must be translated by a sworn translator before submission. Applicants for our Master programmes need not submit GRE or GATE results. If the medium of instruction for your bachelor degree is in English, you do not need to submit TOEFL or IELTS result as well. However, if you have the results for GRE, GATE, TOEFL and/or IELTS, you may include the results in your supporting documents so that they can add value to your application. All applicants are required to submit an additional three (3) certified-true copies of Official or Provisional Bachelor Degree Certificate and Official or Provisional Academic Transcript and additional three (3) passport-sized photographs when you have accepted the offer of admissions and are being matriculated into our programme. The credit card option is available to all applicants after they submit their online application form. Once you submit the online application, an option to pay the processing charge will appear. The service is hosted by PayPal (but does not require one to have a PayPal account) and works like a regular internet credit card payment/online payment option. 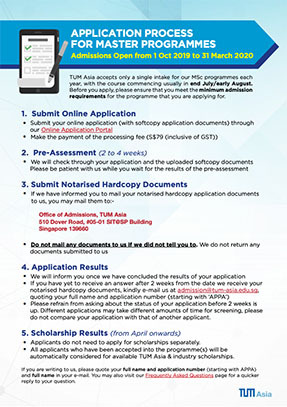 Please send the crossed cheque in favour of ‘German Institute of Science and Technology – TUM Asia Pte Ltd’, together with the completed application form and the supporting documents to our office. Our office address can be found in the Required Documents list. The TUM Asia Online Application Portal is open from 15 October 2018 to 31 March 2019. Students who do not qualify for the Early Bird Privilege will still be screened for admissions and scholarship opportunities. Please submit your online application here. The Early Bird Privilege (EBP) is a 20% deduction off the 1st Installment Tuition Fees only. The EBP is applicable to enrolled students to the TUM Asia Master of Science Programmes only. The completed online application via our Online Application Portal must be submitted and the processing charge must be paid by 15 January 2019 before 2359h (Singapore Time) in order to qualify. The applicant must be accepted and enrolled into the programme in order for the EBP to be in effect. If the applicant is eligible for the EBP, the deduction of the fees will be reflected in the Offer of Admission, which will be issued to the applicant upon acceptance into the programme. The EBP applies for the Academic Year 2019/20 intake only.